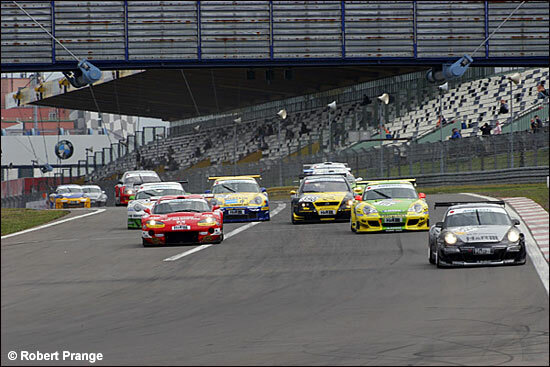 Back to normal: after three weeks of recuperation from the arduous 24 Hours, the German Endurance Championship crowd returned to the Nordschleife for round 4 of the 2006 series, the 46th edition of the ADAC Reinoldus Langstreckenrennen (July 8). 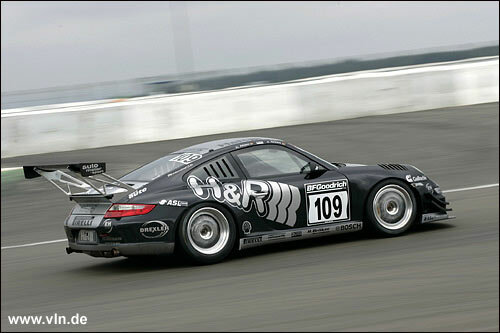 Following their second place (or in their book, “defeat”) in the 24 Hours, the Alzen brothers implemented some modifications to their Porsche 997. These do not include a turbocharger and four wheel drive, but they were good enough to launch them back to where they had been virtually all year in 2005: pole position. 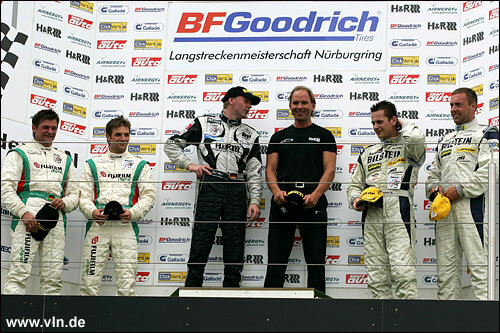 If things were going well for Jürgen Alzen Motorsport, then Manthey Racing was in for a black weekend. The race ran well short of its scheduled 4 hour duration because it had to be red-flagged twice for major accidents, and both times a Manthey car was involved. The Porsche Classic Cup (PCC) ran a race of its own this time, within the VLN field; this was to have a certain impact - no pun intended - on the outcome of the race. “All the improvements we have made after the 24 hour race work perfectly – I think we are among the front runners now in terms of speed,” Uwe Alzen summed up his team’s race at the end of not quite four hours of racing. 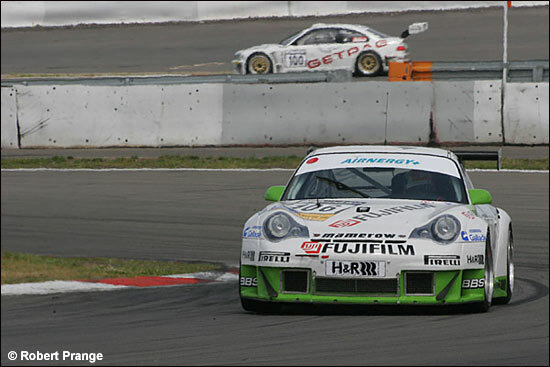 From the start, the batte was on between the Porsches of Alzen, Land Motorsport, Manthey, and the Mamerow team. Uwe Alzen was clocked at an amazing 8:18 at the end of the first lap, nearly matching the pace of his turbo days. The frontrunners kept up this kind of pace until on lap 4, Arno Klasen tangled with a PCC backmarker and crashed the Manthey 996 in a big way. 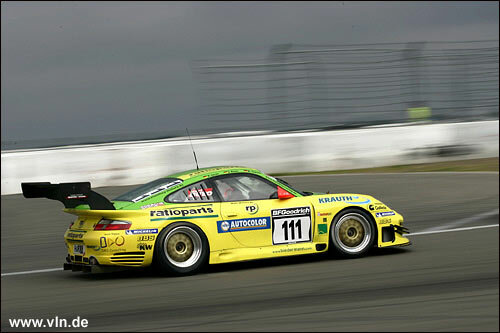 Four somersaults later, he was uninjured save for cuts and bruises, but Manthey’s 24 Hours winning car, #111, was a write-off. When the racing resumed, it took only another four laps until the next big incident. One of Olaf Manthey’s customer cars, for Robin Clark / Jean Breslin / Sean-Paul Breslin, caught the aftermath of another incident at Kallenhard, when oil on the racing line sent it sliding into the barrier at speed. This car, too, is reportedly headed for the scrapyard now. Again nobody was injured, but the armco was bent so badly out of shape by the impact that it protruded onto the track; the repair work took its time, and so the competitors eventually lost about 90 minutes of racing time. Throughout all this, victory for the Alzens never looked in doubt. Christian and Peter Mamerow with their Porsche (below) crossed the line some 41 seconds adrift of the leaders, a fine achievement from fifth place on the grid. 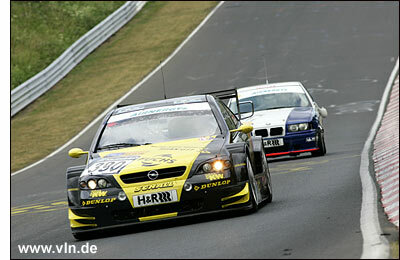 The Opel Astra V8 crew, Andreas and Ralf Schall, nearly made it an all-family podium, but lost its third place to a late pitstop, and Marc Basseng / Patrick Simon were only too happy to take over the last podium spot; a reversal of the fate that had befallen them late in the 24 Hours. 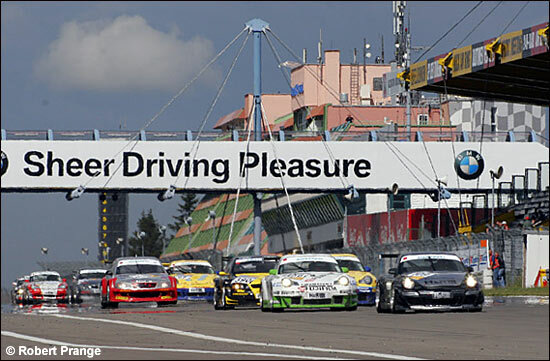 The German Championship regulars were apparently less than impressed with the standard of driving in the historic Porsche series, so it seems unlikely that the two will share the track again in the near future. In the mean time, the German Championship will continue on July 29.